Chief Wiggum: Sorry, Ralphie. The Bakeoff rejected your recipe. Ralph: I wanna be in the bakeoff! Ralph You only had a pretend bite. 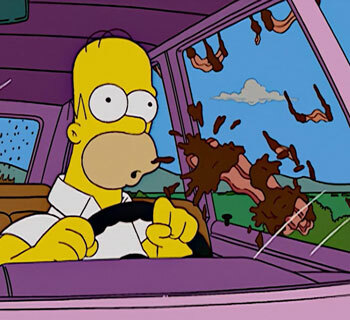 Chief Wiggum: No, I’m eating it. Look. Mmm. 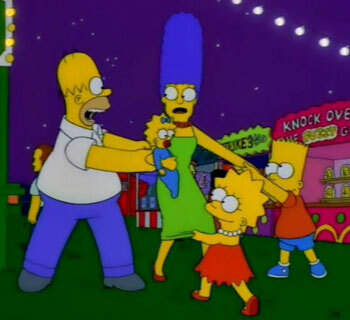 Ralph: Can you taste the thumbtacks? No I did NOT take a real bite of the grilled crayon sandwich. I only took a pretend bite and I’m ok with that. Chief Wiggum is much, much more dedicated to his son than I will ever be to this blog. One question I have about this recipe: did Ralph actually take a bite of this sandwich to perfect his vision on how it should taste? 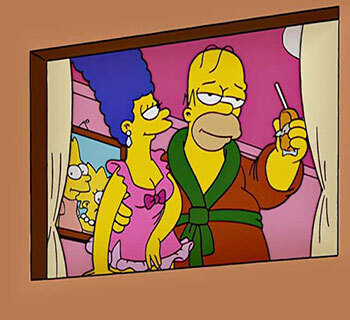 Given how dumb he is by this point in The Simpsons, I’m guessing there’s a strong likelihood he did. This has been a reader request on my “to make list” for quite some time. It was suggested as an I’m Making That But I’m Not Eating That type of entry, which seemed pretty reasonable to me. The issue I ran into was how to make this grilled sandwich without getting melted crayon everywhere. I’ve already practically ruined a waffle iron with a recipe, it seemed reckless of me to ruin another kitchen device, especially on something that is completely inedible. The solution was to lightly grill the bread in a panini press before assembling the sandwich. Maybe that’s cheating, I don’t know – but I’m comfortable with my decision. Lightly butter both slices of bread and place in a panini press for 1-2 minutes. 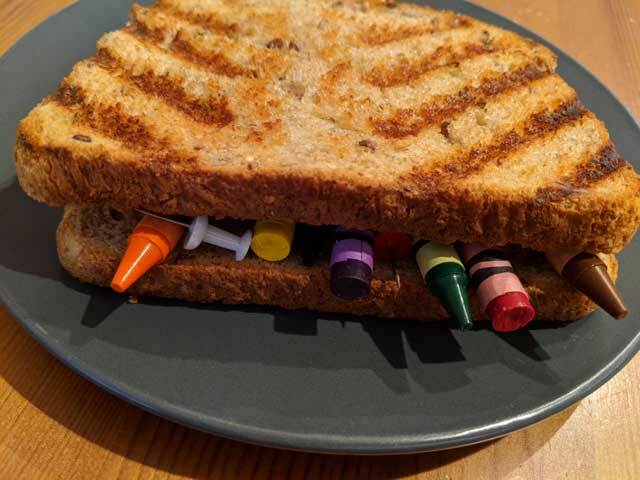 Remove and generously fill your sandwich with both crayons and thumbtacks. Tack a pretend bite. 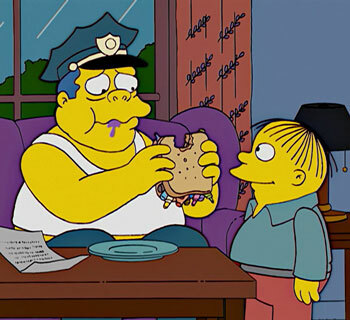 Well, after making the grilled crayon sandwich I have to say the scene where Chief Wiggum actually takes a bite is even more horrific to me now. I accidentally stabbed myself a few times while assembling this dumb sandwich, now imagine BITING down on this? Anyway, I can now proudly say that I’ve made something so terrible that even I wouldn’t eat it. Huzzah! Wait you didn’t take the wrappers off the crayons first? When you cook things you gotta take off the wrappers. That’s what all these frozen pizzas say. So THAT’S why my frozen pizza is always lighting on fire when I put it into the oven!